When we decorate a gift package or a greeting card, we often need to tie a satin ribbon bow. Sometimes the ribbon bow is so small that it’s not easy to make it by hand. Here is an easy and innovative way to tie a satin ribbon bow using a simple device: an ordinary table fork! Isn’t that cool? The size of the fork depends on the size of the bow. Now you don’t have excuse that you don’t know how to make a beautiful ribbon bow. Let’s try it! Take a four-pronged fork with the prongs facing upwards. Hold the ribbon around the left side of the fork. For easy illustrations, we will label one end of the ribbon as A and the other part as B, as shown in the picture. Pass part B over part A at the front of the fork and between the center two prongs of the fork. Pull part B up and again pass it between the center two prongs of the fork over the bow. Pass part B through the knot and pull to the right of the fork. Pull both ends of the ribbon tight. Slip the ribbon bow from the fork. Trim ends to your desired length. Enjoy! 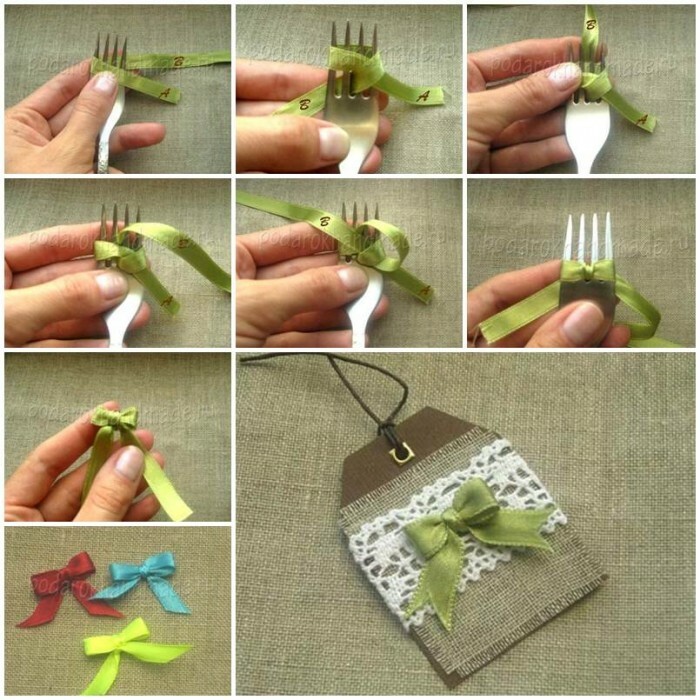 2 Responses to "DIY Easy Ribbon Bow with a Fork"
Thank you very much for your interest in this post!